““Let the little children come to me,” says Jesus. This command was not only for the good of the children, but of the whole community of Jesus’ followers. We need children in the Body of Christ, otherwise the Body will not be whole. 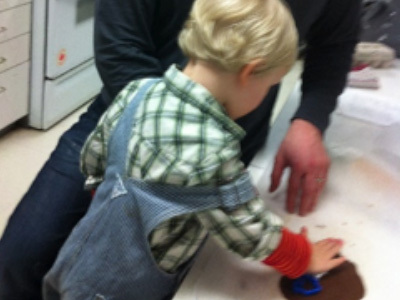 At Christ Church Cathedral, we are committed to welcoming children and their grown-ups, for their sake and for ours. We offer loving support, meaningful worship, and thoughtful Christian education in the context of a flexible, open community, eager to make room for all kinds of families in all aspects of church life. 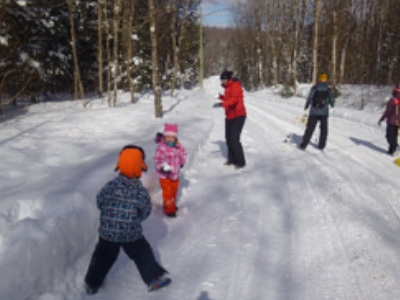 For more information about our ministries with children and families, follow the links below or contact the Revd Jen Bourque. Click here for a calendar of events particularly for children and youth. Christ Church Cathedral Sunday School is held every Sunday (except for the 5th Sundays in a month) during the 10:00 a.m. Eucharist service. Our lead teacher, Jonathan Bailey, an experienced primary school teacher with a particular passion for helping children express themselves through music, drama, and art. Jonathan works with a committed and loving group of volunteers to offer creative, Bible-based, bilingual lessons, primarily taken from the Stories on the Way curriculum. 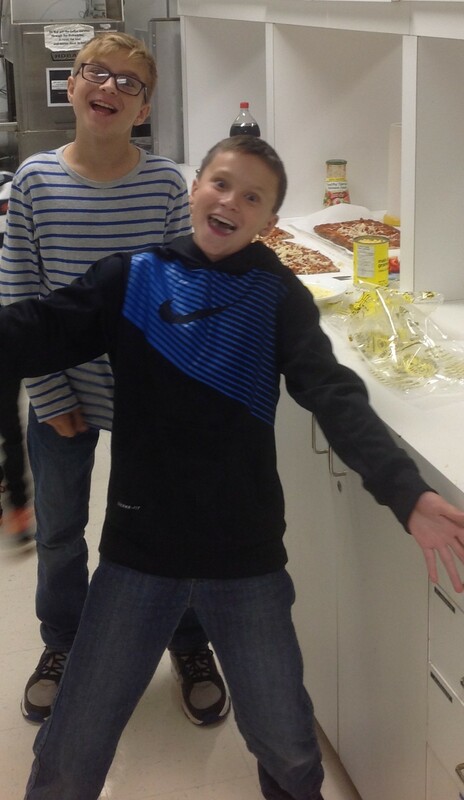 The Sunday School is more than just a school, however. 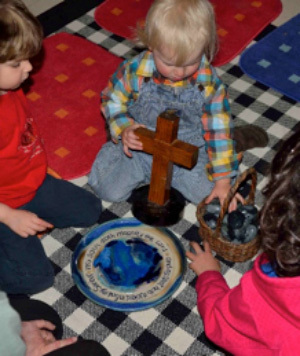 Lessons are put in the context of meaningful, age-appropriate worship that connects with the Cathedral’s liturgical traditions, the church seasons, and the lives of the children. The children pray together, sing together, and offer one another a sign of God’s peace, before returning upstairs to join the rest of the community in receiving communion. And in the summer, Sunday School moves outside! 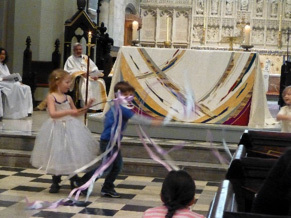 The special Sunday School program in Summer 2014 was part of the Cathedral’s Weave a Net campaign to raise funds and awareness to fight malaria in Sub-Saharan Africa through the use of mosquito nets. Children (and adults) need age-appropriate worship and education but children also need to learn that the whole church is their home, not only the Sunday School rooms, and the whole Body of Christ needs opportunities to worship together. 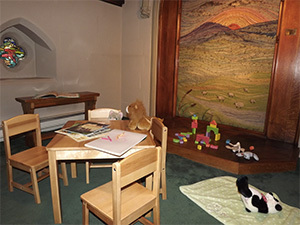 The Children’s Chapel, a lovely little chapel space near the back of the Cathedral, is also available. 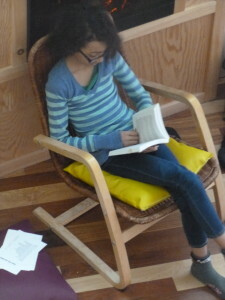 Equipped with kid-sized furniture, story books, paper and crayons, and soft toys, children (supervised by their parents) are welcome to spend services playing quietly (or at least quiet-ish-ly) in a space that is very much their own. The chapel is well-used by children on regular Sundays before and after Sunday School, as well as during special services such as Easter. Special “all-ages” worship is held at 10:00 a.m. whenever a month has a Fifth Sunday. Our goal in these services is not to move Sunday School upstairs but to design services that take into account the diverse needs of our diverse congregation. The presence of the children gives us permission to stretch our liturgical muscles in healthy, energizing ways, experimenting with different ways to pray, read, sing, and respond to the good news of Jesus. We look for ways to reinforce connections between what happens “downstairs” with what happens “upstairs”. For example, the 5th Sunday’s prayers of the people are modeled on the hands-on prayer practice used in the Sunday School. 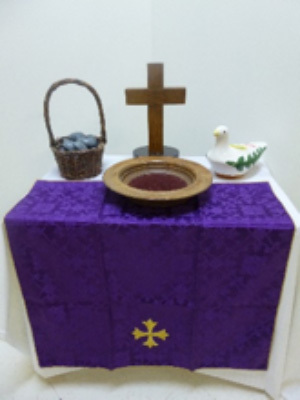 We also try to incorporate the work of the children – the percussion instruments may migrate upstairs to join the choir’s bells or a kid-created altar frontal may be used. Although church is important, the real work of spiritual development and Christian formation happens at home. 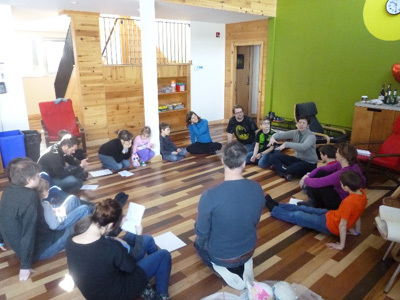 The Cathedral offers regular opportunities for children and their grown-ups to learn, play, and worship together, as well as workshops and discussion groups for parents and guardians (with child care provided). Offerings vary but, over the course of the year, there will be creative, hands-on worship services; inter-generational activities, outings, and lots of fun! 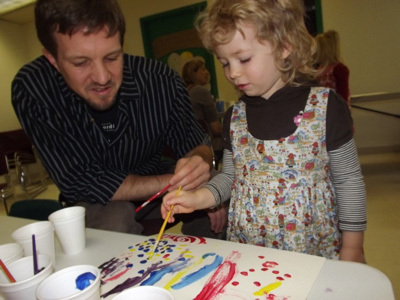 Click here to see a listing of events for families with children. As children become teen-agers, they need a space where they can practice being grown-up while still having the freedom to be kids. They need a space where they can ask big questions about life and faith and identity. They need adults they trust and respect – and who trust and respect them. Christ Church Cathedral creates this kind of space every month on Sleep-over Saturday when youth gather with two volunteer adult leaders for discussion, dinner, games, and (eventually) sleep. Breakfast and church follow on Sunday morning. Thomas Cormie is an experienced youth group leader and Sunday School teacher and dad to one pre-youth group member. During the week, he works as a lawyer for the Department of Justice. Louise Lockhart is new to this kind of ministry but she loves talking over the big questions. She is looking forward to learning a lot – and to playing hide and seek in the Cathedral! During the week, Louise is a registered nurse so not much fazes her!